Since April 2010, Google has started taking load time into account when ranking sites, to help in populating results for Google searches (aka SERPs or Search Engine Results Pages). The web community went into uproar with questions such as what is a slow site, how can website speed be improved, what affects website speed, so on and so forth. The task of optimizing a site’s website speed originally fell into the hands of SEO specialists, as it’s an SEO’s responsibility to improve or ensure a website’s ranking in Google Search results. 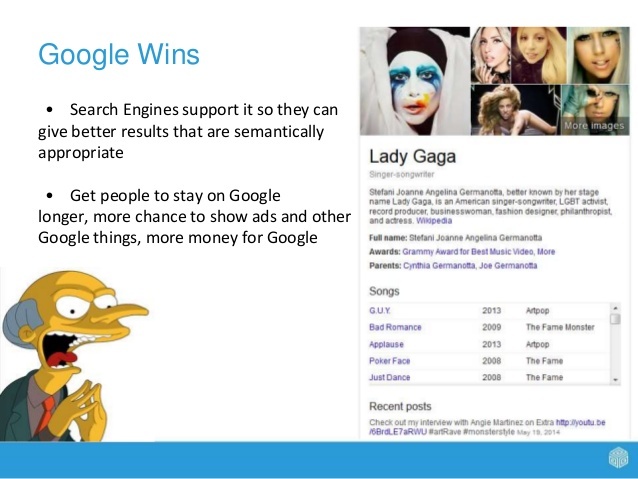 So SEOs had to get to the bottom of this ranking algorithm change and get technical, fast. Soon SEOs were looking for tools to measure site speed and methods to improve site speed. Finally, Google threw out a lifeline with Page Speed Insights in 2011 and now, even more detailed site speed information can be found within a site’s Webmaster Tools account if you have created one and verified your site. I’m not focusing on those today as there are quite a few guides out there already for them, and the tool I’ll be discussing is really quite simple to use. What I’ll be focusing on is a tool called WebPageTest.org. The utility of this tool is like an Alienware 14 laptop compared to a Commodore 64. Sure, the Commodore 64 was helpful and important in the industry, but alas, new and better tools have been developed. In the case of WebPageTest.org it not only provides more comprehensive and detailed information, it is also Developer friendly, as in, provides the details a Developer needs to dig into the programmatic elements that are affecting site speed, rather than the blanket recommendations that Page Speed Insights provides. Did I mention it’s free, for any number of sites, and all you need to do is paste in the URL? Interested yet? Great! Let’s continue. Paste the URL of the site/page you want to test. Start with the homepage of the site and also test some of the popular pages of your site. If you’re not sure what the popular pages of your site are, review the “Landing Pages” section of Google Analytics to see what pages visitors go to first/most often when visiting your site. 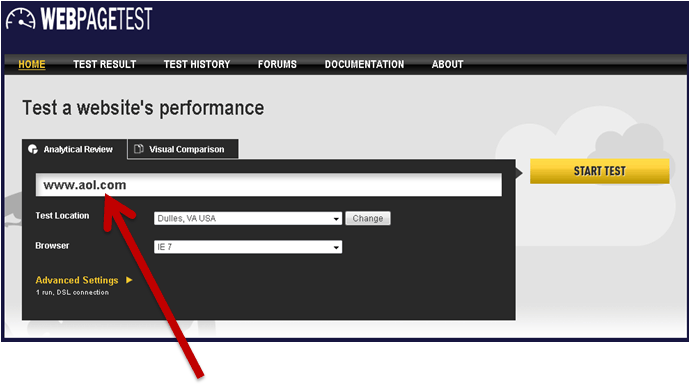 Select the browser you want to run the test with and if you’re on a desktop or mobile device. Note that some browsers and devices are inherently slower or faster so you are likely to see variation in speed if you test using different browsers. (So basically, do not be alarmed to see variation in page speed time by browser). Click “Start Test”. Easy as pie! Change originating location of test. This option is helpful for sites that receive traffic internationally, overseas mainly. If your site does receive international traffic, test from within the regions from which your site receives said traffic. Note any areas with slower times. Later, the section “CDN”(Content Delivery Network) may be useful for speed improvements for international sites. You’ll immediately notice the report card form of results. This report card is a helpful indication of how your site is doing overall (note the score here for MSN.com of 89/100) and specific areas of improvement, such as “cache static content” for which MSN.com received an F. Don’t be too alarmed by a “D” or an “F” in any one area, this isn’t High School! This is just a breakdown of elements that affect overall site speed. Each area may not be relevant for your site (again, use of CDN may not be needed for average sites not expecting overseas visitors). This is more of a guide, if indeed your site speed is slow, giving you insight into areas that can be improved at a bird’s eye level. Who doesn’t love a waterfall? Niagara, Angel Falls, Waterfall Showerheads and “Waterfall View” of your site loading in browser – pretty nice stuff. 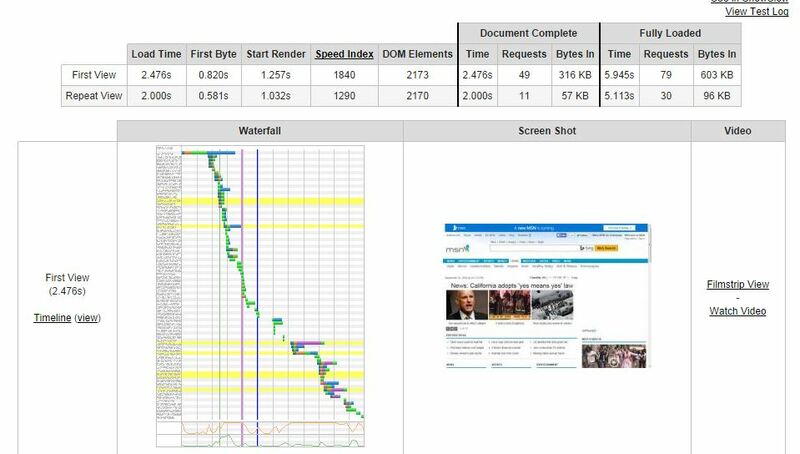 Webpagetest.org gives a waterfall view of your site loading with details along the way and an overview of what was experienced, from redirects to DNS lookup times: no detail is spared! This makes web developers happy. Page Speed Insights doesn’t provide this level of information, only suggestions about what to fix. Going to a developer with a laundry list of “suggestions” without seeing which aspect is really affecting site speed will likely lead to a much longer “Do Later” list, along with revamping the database and redesigning the site. What Does the Waterfall Show? The waterfall shows how each item loads on a page, from the first item to the last and how long it takes to load. For each time it shows various aspects that affect its loading speed – DNS lookup, initial connection, SSL Negotiation, Time to First Byte, etc. If the overall “First Byte” and “Start Render” time are slow (generally considered 3 seconds or longer), viewing how each element loads can give insights into improving this critical first view of the site. The First Byte time is the time from when the visitor started to navigate to the page until the first bit of the server response arrived. The bulk of this time is usually referred to as “back-end time” and is the amount of time the server spent building the page for the user. DNS lookup time, initial connection time and SSL negotiation often affect the First Byte time. As site visitors expect content to at least start loading right away, the Start Render time is critical for the appearance of content and keeping visitors onsite (and not hitting “refresh” 10 times hoping the page will load). The Start Render time for MSN.com is reported as 1.257 seconds, which is great. If this time is 3 seconds or greater, review whether there are multiple 3XX or 4XX responses on content that must be downloaded, large image files, custom fonts and the overall “Content Download” time for the individual items, all of which could be a factor here. Compression Transfer is usually another easy win, especially text. If you’ve ever tried to “zip” a file to send as an email attachment because it was too large as is, then you’re familiar with this concept. Text files will shrink quite dramatically when compressed (aka “zipped”), although images do not compress quite so readily, so they are detailed in a separate section. As mentioned in a previous post on site speed improvements, the way a file is saved can impact file size and ultimately site speed, especially on home pages that are mostly images. As outlined in the example below, there are at least three versions of one image that are smaller file sizes, yet no apparent difference in quality of the image. The file size goes from 213K to 25.54K to 11.74K down to just 7.416K by opting to “Save for Web” and reducing the “Quality” to 65. Also, in Webpagetest.org you can get a full list of the images on the page that were tested and view the details, recommended optimization and estimated savings after optimization for each image. Use the minimal image size needed for web resolution. For editing photos, programs like Photoshop often offer “Save for Web” options to optimize the images for use on websites by automatically compromising between image compression (via the JPEG format) and minimal file size. If your image editor does not offer such a setting, configure your image compression settings so they look acceptable at 72 pixels per inch (ppi, or sometimes also referred to as dots per inch, or dpi), using the pixels setting as unit measures for width and height. Set the pixel dimension (typically width) to the size you want the image to be on your page. You can often use JPEG compression as high as 70-85% and retain the image quality you want. Advanced optimization involves further (lossless) compression of JPEG and PNG files. There is a free web-based tool by Yahoo called Smush.it You can enter an image URL to Smush.it and it will provide the losslessly compressed image. There is also a plug-in for GIMP which is called “Save for Web”. It allows visual adjustment of various image parameters such as quality, number of colors, dimensions, etc to reach optimal file size see http://registry.gimp.org/node/33. CDN stands for “Content Delivery Network”, as in a network that is setup to deliver a webpage’s content (images, text, etc). As each request from the server travels from a visitors computer to wherever-in-the-world the website’s server is, CDNs have servers all over the world that are close to users that serve a web site’s static content from servers close to users. Essentially, this is useful to speed up the delivery of content to a visitor that is far away from the server (as in, overseas) or if the web server is actually overseas from where the majority of visitors are located. That’s a rundown of the WebPageTest.org tool, the meaning of the results, and most of what you are likely to find. There are a lot of hidden nuggets of information that can be seen by clicking around. My recommendation is to start on a journey of discovery, reviewing each section and noting how the webpage is delivered as a whole before relying on the prominently displayed “Report Card”, because, as mentioned before, sometimes the report card grade does not equate to the largest area of improvement for your site speed. It’s still by far one of the best tools for digging into ways to improve site speed – just get your detective hat on first! Cat’s out of the bag. The world knows your secret. The secret that you haven’t invested in creating a mobile-friendly site. Google has made some noise this past week with the feature in Tech Times and all the SEO blogs and forums with the announcement that Google is placing labels next to a website’s listing in Google mobile search results denoting if a site is “mobile-friendly” or “not mobile-friendly”. Google stated that the labels are a “first step in helping mobile users to have a better mobile web experience.” And love it or hate it, the labels are likely here to stay. In today’s digital world, companies are being challenged with creating optimized experiences for mobile and tablet users more often than not. Whether the choice is via a mobile-friendly website, or through responsive web design and/or a mobile app – the mobile experience can no longer be ignored and Google is apparently reinforcing mobile’s importance with this label. Whether Google’s label on mobile results is more of a stick than a carrot, Google has been testing giving websites a mobile distinction since September, which has provided information about mobile optimization via Page Speed Insights since before 2014. Just now, in November, Google has officially launched the “mobile-friendly” label in mobile search results. What can you do to make your site mobile-friendly? There are some best-practices to follow in developing a mobile-optimized website and this handy mobile guide from Google has a pretty comprehensive listing of things you need to know about mobile-friendly websites. Are there any tests to tell me if my site is mobile-friendly? 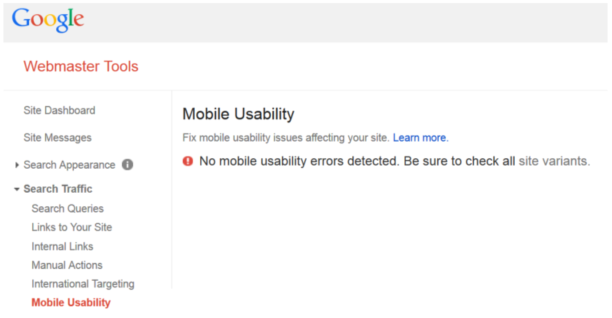 The new mobile-friendly tester by Google. This one was announced recently, though appears to still be in Beta. Page Speed Insights. This gives information for both the desktop and mobile version of your site. 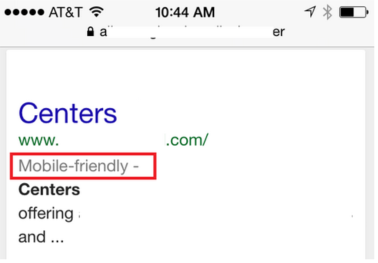 Note that this new “Google Mobile-Friendly Test” appears to be in Beta, as it sometimes yields results that accurately show the mobile site and sometimes it doesn’t. Below is a side-by-side example of one website, run twice, that is actually shown as “Mobile-Friendly” in the search results. Confusing? Definitely. However, the long established tool known as Google PageSpeed Insights has a mobile friendly test component and appears to always show the correct mobile site and the results do not vary. Google hasn’t decided if it’s going to be using mobile friendliness as a ranking factor just yet, but with the reality that mobile Internet usage has surpassed desktop usage this year, now is the time to ensure your digital assets are mobile optimized. Yet, we know that users do indeed tell stories through data, whereas we can’t quite pinpoint the genre of farm animals dreamt up by androids (yet). In fact, here at Delphic, we’ve found that there is more story-worthy data to collect from our very own website users than ever before. And in a world where “big data” is everything, being able to artfully extract that story is key. More than half of all individual purchases turn into a year-long membership. This is great because I understand that some people aren’t ready for a year-long commitment to cookies being delivered, and some only need cookies for a special occasion (housewarming party). Yet, half of everyone decides that this is the solution for them! Given other conversion rates and lifetime value calculations, I noted that this is high on the list of important opportunities. And with the data I gathered, I have a better idea of how to optimize to the traffic I’m already getting, as well as what my content should reflect (my service is near you!) to get more traffic in the door. Let’s start with addressing the premise – Why care about responsive design or designing for mobile visitors to your site and what is responsive web design? First of all it’s hard to read a traditional website on a small mobile screen. All the pinching and scrolling frustrate the average user, not to mention how cumbersome filling out a form could be. Have you tried to fill in a form on your own site’s non-mobile optimized site? Just try it.So what is responsive web design? It’s creating one website that is controlled by CSS to render different looks on all sorts of browsers and devices, from a wide screen monitor to a 13″ laptop to an iPad, iPad Mini, Chrome Book and any smart phone. Check Wikipedia for an example and details. How many people, do you ask, are browsing your site on a phone or other mobile device? Also, data on several sites and studies (contact me and I’ll share screen captures of GA data) that show mobile traffic to websites has steadily increased over these past 3 years. I’ve seen an average increase of 100% equating to 35% or so of visitors now getting to sites from their mobile device. You don’t want to ignore such a large percentage of site visitors. Check your own Google Analytics data to see how your site fares. Admittedly we were pretty shocked about this steady and substantial increase. 1. iPad and other tablets changed the game, tablets do look at website full size. It used to be simple to install the Duda mobile app and be happy with your now smart phone ready display… not anymore though. With iPad, Mini iPad and all the unforeseen variants to come about, there are multiple screen sizes that your site will be viewed at and for which the interaction should be easy. 2. You can create customized experiences for each size of display. 3. Updates to all versions are easier. With responsive design when you make a code update it will render on all devices since its the same site just using one CSS. There are some plugins out there like Duda mobile that can make a mobile site with a m.yoursite.com domain for a WordPress site with a simple plugin and launch, however, it doesn’t address the other mobile devices – such as tablet screen sizes. 5. Lastly, if you don’t , your competitor will. When presenting an SEO Evaluation to a client I’m often asked how I got the information, specifically, where did all the data come from. I understand this question because in my days of public opinion research every singly media source from the Miami Herald to the New York Times has strict requirements on how much data is needed, where the data comes from and if the data supports the conclusions made. Also, many small business owners want to see for themselves where they stand online, without entrusting some unknown SEO guy’s random email that “your site could be better optimized, I can do it for only $____ (enter exorbitant price). How to Get a Business in Google Local? I get this question often from people running their own start-up to established businesses with an annual marketing budget. It’s also become increasingly important as now Google is devoting the top organic search results to the Google Local listings. After I mention that the steps are relatively easily, many presume that a few days after spending a few hours of work that they should show up for all sorts of Google searches related to their business. FALSE! While the steps are easy, it’s the follow through that matters most. The follow through can be tedious and time consuming, but well worth the effort. Go to Google and search for your business, by its full business name. If your business is trademarked under your name, search for a few variations of your name (First,Last then Last,First then incorporate any titles or distinctions you have). You want to do a thorough search because having multiple listings in Google is not good. After you’ve done this search, if you’ve found a listing, follow the steps in Google for claiming and verifying the listing. NOTE, make sure the business address, telephone number and email actually reach you – Google will either call you or mail you the verification number and emails periodically come with free goodies.